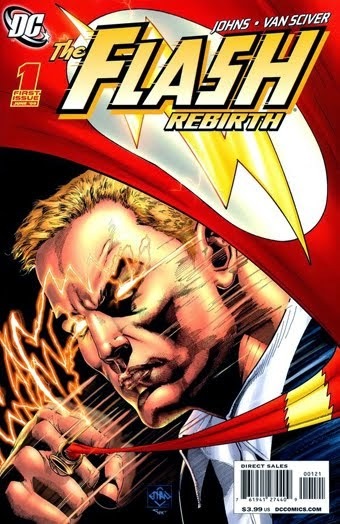 • PLOT SUMMARY: "Lightning Strikes Twice" - Through the decades, many heroes have taken the mantle of The Flash, but they all ride the lightning that crackles in the wake of the greatest hero the DC Universe has ever known, the man who sacrificed himself to save the Multiverse: Barry Allen! Following the events of FINAL CRISIS, Barry has beaten death and returned to a fast-paced world that a man out of time wouldn't recognize. Or is it a world that is only just now catching up? All the running he's done before was just a warmup for the high-speed race that he and every other Flash must now run, because even though one speedster might have beaten death, another has just turned up dead! From Geoff Johns and Ethan Van Sciver, the visionaries responsible for the blockbuster GREEN LANTERN: REBIRTH and THE SINESTRO CORPS WAR, comes the start of an explosive and jaw-dropping epic that will reintroduce to the modern age the hero who single-handedly birthed the Silver Age of comics! DC history will be made, and the Flash legacy will be redefined! Written by Geoff Johns. Art by Ethan Van Sciver.